Doncaster scored two late goals to beat Rochdale and earn their fifth away victory of the season in League One. Theo Robinson headed in a corner and Curtis Main flicked home the clincher after they twice hit the woodwork following Matt Done's sending off. 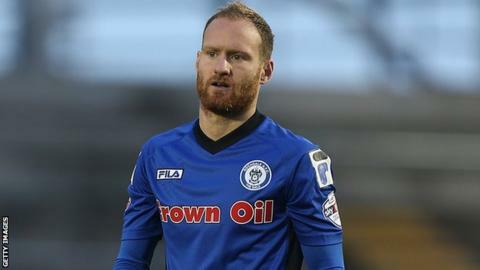 The Rochdale forward was shown a straight red card for a foul on Doncaster's James Coppinger. Done had put Rochdale in front early on with a diving header, but Kyle Bennett shot low into the corner to level. Doncaster generally carried the greater threat going forward and missed a number of chances before Done's dismissal gave them a numerical advantage. It looked like Rochdale might hold out when Nathan Tyson headed against the bar and Bennett struck the post with a shot, but the pressure told when Robinson's first touch after replacing Paul Keegan put them in front for the first time. The win lifted Doncaster one place to 16th in the table, with Rochdale slipping two to ninth, three points outside the play-off places. "It was going to be a difficult game even though we went 1-0 to the advantage. "They caused us problems all afternoon. "It was a wrestle and it was going to continue to be a wrestle but obviously when we went down to 10 men it was very difficult for us." "We got off to the worst possible start, conceding and then after that I thought the boys were fantastic. "Even when it was eleven versus eleven, we played football, we created. "We had as many chances as I could remember in a game and it would have been a crying shame if we hadn't won the game." Match ends, Rochdale 1, Doncaster Rovers 3. Second Half ends, Rochdale 1, Doncaster Rovers 3. Substitution, Doncaster Rovers. Jack McKay replaces Nathan Tyson. Goal! Rochdale 1, Doncaster Rovers 3. Curtis Main (Doncaster Rovers) right footed shot from the centre of the box to the centre of the goal. Assisted by Reece Wabara. Goal! Rochdale 1, Doncaster Rovers 2. Theo Robinson (Doncaster Rovers) header from the centre of the box to the top right corner. Assisted by Kyle Bennett. Corner, Doncaster Rovers. Conceded by Ashley Eastham. Corner, Doncaster Rovers. Conceded by Joseph Rafferty. Substitution, Doncaster Rovers. Theo Robinson replaces Paul Keegan. Corner, Doncaster Rovers. Conceded by Matthew Lund. Attempt missed. Curtis Main (Doncaster Rovers) right footed shot from the centre of the box is too high. Attempt missed. Nathan Tyson (Doncaster Rovers) left footed shot from the centre of the box is close, but misses the top left corner. Kyle Bennett (Doncaster Rovers) is shown the yellow card. Substitution, Rochdale. Joseph Rafferty replaces Calvin Andrew. Kyle Bennett (Doncaster Rovers) hits the right post with a left footed shot from outside the box. Andy Butler (Doncaster Rovers) hits the bar with a header from the centre of the box. Corner, Doncaster Rovers. Conceded by Conrad Logan. Matt Done (Rochdale) is shown the red card. Second Half begins Rochdale 1, Doncaster Rovers 1. Substitution, Rochdale. Scott Tanser replaces Michael Rose.